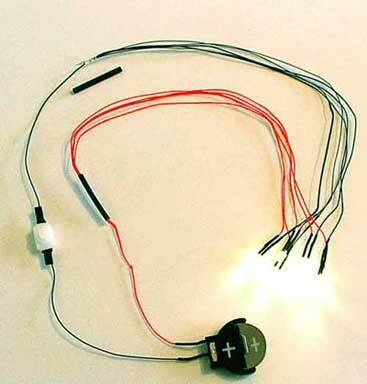 An easy way to bring power to your 3V LEDs. Add some cr2032 batteries to your order along with the coin cell holder and you will be ready to run as soon as this package arrives. You can find more cr2032 batteries at stores. This coin cell holder switch unit will run from 1 - 10 LEDs safely and brightly. As you can see from this picture, the 3V battery slips right into the holder. And the LEDs are connected red wire to red wire. And black-to-black. Protect connections with tape or use our shrink tube or your own, or use tape. The red wire is 8 inches long. The black wire is about 4 inches on either side of the switch. The coin cell holder is .24 inches thick and .9 inches across at the widest point. You can clip the plastic "wings" to save 0.1 inch on the width if space is at a premium!